Published on this day in history, 1843, Charles Dickens’ “A Christmas Carol” was written under intense financial pressure – his wife was pregnant with their fifth child, his parents and siblings were in need of funds, and he had a large mortgage payment looming. Dickens was also angry over how little money he’d made from his previous novel, ‘Martin Chuzzlewit.” When his publisher offered him a lump sum payment for “A Christmas Carol” he said thanks but no thanks, and partially published the book himself in order to receive a percentage of each sale. Dickens wanted as large an audience as possible for his book, so he set the price at a very reasonable five shillings. The book quickly became a best seller; the first edition numbering 6,000 copies had already sold out by Christmas Eve. “A Christmas Carol” had run through seven editions by Spring of 1844. Despite this, Dickens didn’t make much off of it at first due to high production costs and legal bills. His initial profit that first Christmas was £230 (about £19,000 today), or about a quarter of what he had hoped. Subsequent years after the first Christmas saw slightly better returns, such as £744 in 1844. However, various legal battles with publishers pirating the book deeply cut into his profits. For instance, in 1844 when he made the £744 off the book, he spent about £700 on legal expenses. Despite “A Christmas Carol” not pulling the author out of his personal financial quagmire by itself, it did help the popularity of his other works and also helped redefine how Christmas was celebrated, not only in Great Britain, but in the United States as well. 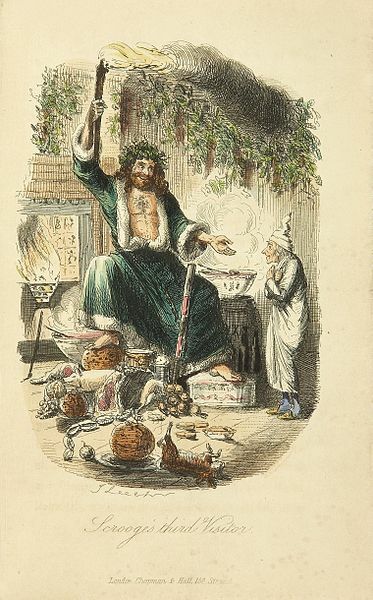 Many of our Western ideas of what a “traditional” Christmas entails can be directly traced back to Dickens’ novel, such as treating Christmas as a festive time for a secular, family get-together with games and specific foods and drink. Before this, it was generally treated by most as a time for a community / church-based, somber event. As a result of this, the holiday had been dwindling in popularity around the point this novel came out. In the end, the book helped revitalize the celebration of Christmas, spearheading the Victorian resurgence of the holiday that was to come. It even helped popularize the phrase “Merry Christmas”. The publication also coincided with the early years of Queen Victoria’s reign and marriage to Prince Albert, who brought many holiday customs from his native Germany that we associate with a traditional Victorian Christmas today, including the Christmas tree. The book is also a none-too-subtle slam of rampant industrialism and capitalism. Dickens’ own character was shaped by his father’s incarceration in a London debtor’s prison, and the fact that Charles himself was forced to leave school and work in a boot blacking factory at the age of 12. The experiences of the Cratchit family were based on Dickens’ own life in poverty-stricken Camden Town, London. “A Christmas Carol” has been re-read, referenced, reinterpreted, and parodied more than almost any other work of literature. If you say “bah humbug” or “God bless us, everyone!” you won’t need to explain yourself. Just about everyone will get the reference. Not too shabby for a book written in a dead panic to pay the bills.